Q: What is the meaning of the term complete protein? Dietary protein is generally classified into two forms, namely complete and incomplete sources of essential amino acids. Complete proteins contain all essential amino acids and are often referred to as high quality proteins. In contrast, incomplete proteins are low in one or more essential amino acids. Most plant proteins, other than soy protein, have lower contents of certain amino acids and they are not considered complete proteins. However, plant proteins of different types are often complementary and can provide all essential amino acids in the diet, e.g. pea combined with rice protein. Q: How well is rice or pea protein tolerated in the diet? Rice protein and pea protein have an amino acid profile that is not only complete, but it is well assimilated by the body. Rice and pea protein do not have the tendency to cause digestive upset in a manner similar to whey protein. Both pea and rice protein are hypoallergenic and do not contain gluten or lactose in comparison to wheat or milk proteins, respectively. While rice protein and pea protein have lower digestibility scores than whey, egg, or soy protein, this property may be important in lowering glycemic indices and altering blood lipid profiles in a favorable manner. Q: Why choose plant proteins over whey or animal protein? Many myths surround the notion that the human diet must be based on animal protein. There is no doubt that animal protein is a valuable “complete” protein but it is associated with a high intake of cholesterol and saturated fat. This association tends to promote cardiovascular and other chronic degenerative disease. Several plant proteins are beginning to be favored because they are known to have a high biological (nutritional) value. Plant proteins contain sufficient quantities of essential amino acids that often form complete protein intakes when combined e.g. pea protein with rice protein. Q: Is hexane or organic solvents used to extract rice or pea protein? 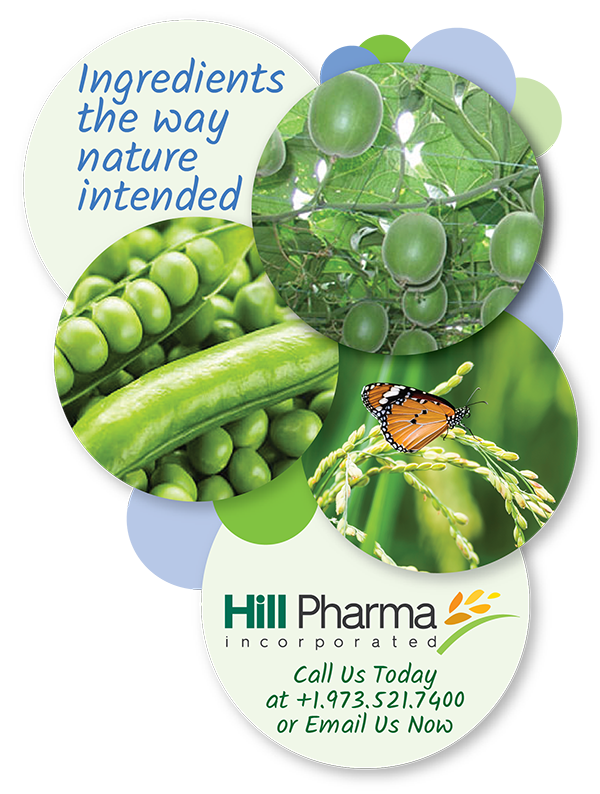 Proteins (Ortiva™ and Pisiva™) are separated from raw pea (Pisiva™) and rice (Ortiva™) by enzymatic methods. Q: How is the market trending for rice and pea protein? According to recent reports there has been a substantial increase in demand for rice and pea protein. Q: How does rice protein compare to whey protein in terms of muscle building? Recent studies of the effects of 8 weeks of whey or rice protein supplementation on body composition and exercise performance show that both whey and rice protein isolate have substantial equivalence in overall outcome (Jaeger R. Nat. Prod. Expo, March 9, 2013). Both whey and rice protein isolate administration, following resistance exercise, improves indices of body composition and exercise performance. In these studies, there was no detectable difference in psychometric scores of perceived recovery, body soreness, or readiness to train. Moreover, significant time effects were observed in which lean body mass, muscle mass, strength, and power all increased while fat mass decreased (Jaeger, ibid, 2013). Q: What is a generally accepted guideline for the RDA of protein? An acceptable general guideline for protein in adults is 0.8 grams per kilogram of body weight.